As promised, here’s another in our series of recipes adapted for Guardian Service cookware. We've come to call this dish "Chicken Schnitzel," not just because it's fun to say, but because it's an adaptation of a traditional veal Weiner Schnitzel recipe from “Lüchow’s German Cookbook” (by Jan Mitchell, Doubleday, 1952). Lüchow’s restaurant was a New York destination for fans of traditional German fare, operating for a full century from 1882 to 1982 on E 14th St in lower Manhattan. The restaurant provided an atmosphere of theatrical Gemütlichkeit (arguably the pre-Sardi's Sardi's) while serving celebrities such as operetta composer Victor Herbert (he founded ASCAP in one of Lüchow's booths) and screen star Marlene Dietrich and hosting the post-concert party for Judy Garland’s legendary Carnegie Hall concert. I’ve simplified their approach to the batter and find it browns to perfection on the Guardian Service Griddle/Broiler. It’s not unlike a “chicken-fried” chicken, although greaseless, one of the chief selling points of the Guardian Service Griddle/Broiler technique. In a shallow baking dish mix cheese, flour, breadcrumbs, parsley, salt, pepper and nutmeg. 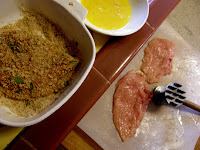 Pound chicken breasts until thin; dip in beaten egg and coat well with breadcrumb mixture. Meanwhile, set the Guardian Service Griddle/Broiler over medium low heat until it passes the “water test”; see previous posts for more info and photos. (NOTE: this is a crucial step for success when cooking with this unit). Place the breaded chicken breasts on the griddle and cook over medium heat until browned on each side. Remove to platter, squeeze fresh lemon juice over the dish and garnish with parsley and lemon wedges. Optional: serve with cream gravy with shallots and mushrooms (pictured). Sauté shallots and quartered mushrooms in butter for 10-15 mins, remove from saucepan and reserve. 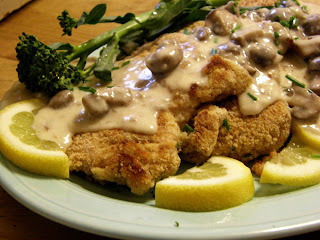 Make a basic white sauce, reincorporate the shallot/mushroom mixture and ladle over fried chicken cutlets. Cooking right meant protecting your family's health. With memories of the food-starved 1930s, modern Americans had malnutrition on their minds. Century Metalcraft capitalized on the national anxiety and published moralizing ads in home magazines warning mothers they were duty-bound to preserve the vitamins lost in "thoughtless, ignorant, outdated cooking." For side column endorsements, the company hired food guru Adelle Davis, a founder of California cooking, synonymous today with Alice Waters and her followers who promote holistic meals made with fresh, organic foods. A biochemist graduate from UC Berkeley, Davis launched a 30-year career in 1947 with her landmark book, "Let's Cook It Right." She defined the well-organized kitchen, suggested menus and, like First Lady Michelle Obama, warned against high-calorie, low-nutrition diets. A waterless method, promoted by Guardian Service as unique to their glass-topped caldrons, was essential for preparing healthy meals the Davis way. The Times also posted photos of additional Vintage Guardian Service Ads from our collection. Tonight's dinner (and our next blog, this time for sure): Chicken Schnitzel, a recipe adapted for Guardian Service from a traditional Weiner Schnitzel recipe in Lüchow's German Cookbook, Jan Mitchell, 1952. While most of our posts have been recipes or food philosophy, I recently found this Guardian Service Ware printer's block and thought I'd write a bit about what first attracted us to the cookware line: its esthetic. A printer's woodblock of the Guardian Service Logo. The copperplate engraving (3" (7.6 cm) in diameter) is an artifact of American industry, commerce, design, branding and craftsmanship. The Guardian Service Knight is the archetypal Knight in Shining Armor, an embodiment of the virtues of the cookware, the finest in American design and craftsmanship. He is the Defender of Nutrition and Your Family's Health and Vitality, but he's a strong entrant in the smackdown arena of macho American Corporate brand characters like the Arrow Collar Man, the Brawny Man, the Marlboro Man and Mister Clean, high testosterone males as solid and reliable as the product they push and titillating to their (presumably female) audience. The Guardian Service Knight no doubt also appeals to America's romance with Camelot and courtly life, the ideal image for an American middle class bent on conspicuous consumption, a brand which inspires the buyer to nobility not because she is the best, but because she buys the best. 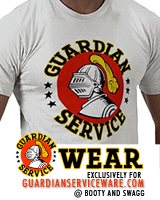 Sir Guardian Service to the rescue. 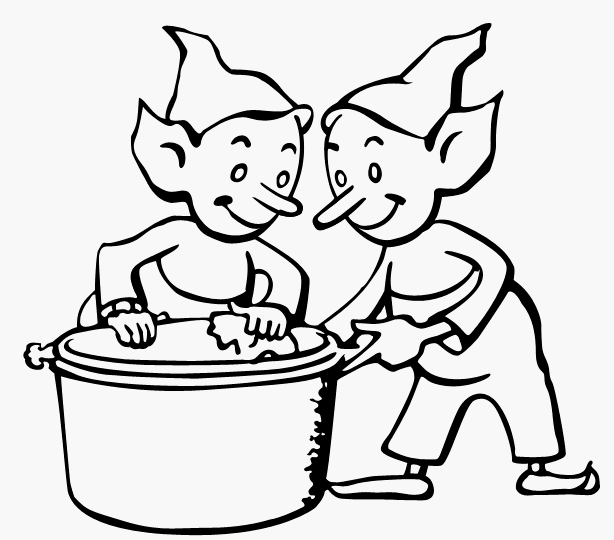 The Century Metalcraft Corporation, founded in Chicago, actually had two or three related cookware brands. First was the Silver Seal line, made in Chicago from 1933 until 1938. 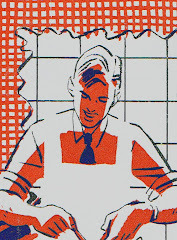 Upon moving to Los Angeles that year, Century launched Guardian Service, “the world’s finest combination cooking and table service equipment.” After Pearl Harbor, the glass lids were introduced, apparently as aluminum grew scarce. By VJ Day, Century had been thrown “100%” into war production and morphed into Los Angeles’s fledgling aerospace industry. We’re still hunting for reliable records about what contribution the company made to the New Deal and to airplane technology, but there is every reason to believe the company was in fact vital to America’s industrial triumph, given the smelting technologies and glass tempering processes they had pioneered or developed, and quickly mastered. After WWII, Century resumed Guardian Service production. These were the boom years, and probably the vast majority of cookware available today was made in this time. 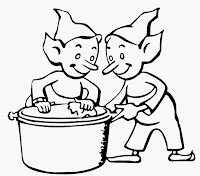 In the late 40s and 50s Century brought out the Savemaster and Presto Pride lines, as the company seems to have slowly merged with National Presto. They appear to have “bet the farm” on pressure cookers being the technological wave of the future. At any rate, the 1956 fire marked the end of the Guardian Service brand. A quick sampling of logos below shows the brand's evolution. 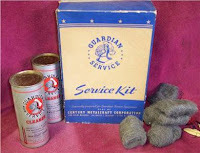 The Century Metalcraft Corporation's earliest line, "Silver Seal," was redesigned and re-branded as "Guardian Service"(with a knight and crossed-swords logo) in the late 1930s. This logo was followed by a series of slightly different knights through the 1950s, all left-facing, eventually framed by three stars on either side. Additional photos: A knight with crossed halberds appears as the company switches to manufacturing glass lids during WWII and thereafter. 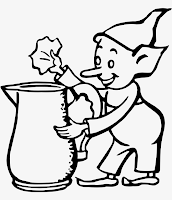 The Guardian Service Cleaner canister of the 1940s introduces a whimsical series of elves, each busily polishing and scrubbing aluminum pots. The Savemaster brand was acquired late in the company's history as the company merged with National Presto Industries. Ads in magazines like Parenting and Ladies' Home Journal were often accompanied by nutritional claims and were meant to appeal to a select audience of homemakers, an earlier generation of American foodies. 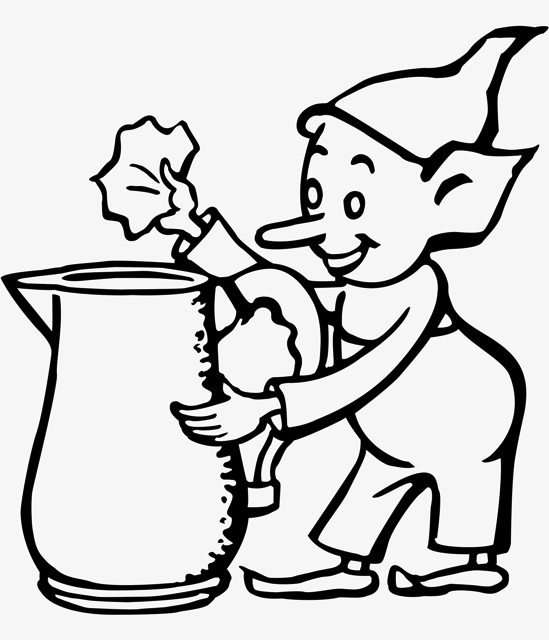 We've been able to hunt down some of the company's history (the labor union disputes, the wartime aerospace newsletters, the classified ads requesting "Big Men"—salesmen who would not only heft the cookware in and out of homes for demonstration meals, but who might look the knightly part... but WHO designed this stuff and who created the campaign that gave the company its enduring image? If any readers have information on the engineers or designers who created the Guardian Service Ware line, chime in with comments—we'd love to hear from you. 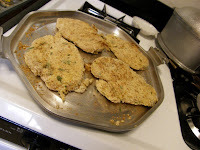 Next post, back to cooking: Greaseless Schnitzel for the Guardian Service Griddle/Broiler.